Baileigh Plasma cutting tables with hypertherm plasma cutting machines. 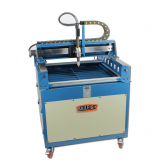 230 volt table and plasma cutter, pierce capacity 10mm, cut capacity 19mm. Delivery, Installation and training included mainland England and Wales, price supplement may apply to other areas.